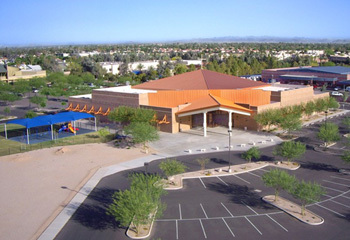 The First Southern Baptist Church of Glendale (FSBCG) is located on the west side of the Phoenix metro area, near the intersection of 59th and Peoria Avenues. Each Sunday morning, small groups participate in in-depth study of a short passage from the Bible. On Sunday and Wednesday evenings, we offer various seminars to provide instruction for spiritual growth, and a practical application of biblical principals to modern day life issues. People with disabilities and special needs are welcome and included in all church activities. In our services, we strongly believe in using God’s gift of music to honor and give Him praise. In our Childrens Ministry, we strive to nurture and encourage children and their families in a growing knowledge of our Lord Jesus Christ. For our Youth and Students, our goal is to IMPACT our world by sharing God’s Light and Love. Our Men are involved in weekly Bible Study and a monthly breakfast time of devotion and prayer. The Women’s Ministry focuses on Christ-centered discipleship, worship, evangelism, missions, and fellowship. And, since all of life is to be dedicated to God and is to be used to bring Him glory, our Senior adults continue to be growing individuals with a wide range of interests and abilities. The First Southern Baptist Church of Glendale was originally organized on March 4th, 1926, as Calvary Baptist Church. At that time, Glendale was mostly farms with a small population clustered near the S.E. corner of the city. The church began with 170 members. Rev. Ed G. Butlerwas called as the first pastor. The church was the fifth Southern Baptist Church in the state of Arizona. 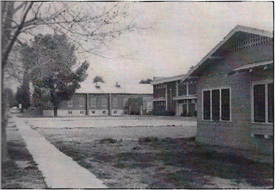 Since the church did not own any property, the church first met in Glendale School’s Unit 1 auditorium. Two lots were later purchased on the corner of 2nd Avenue and C Avenue for $1000 and a building project was started. 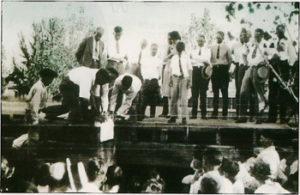 The picture to the right shows the men of the church laying the corner stone. 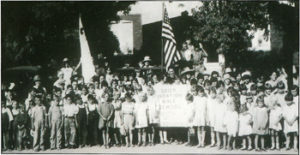 On December 4, 1926, the first services were conducted in the new auditorium with the first Vacation Bible School taking place in June of 1928. The original auditorium was built for the cost of $10,000 – a nominal sum by today’s standards – but a sacrificial amount in 1926 dollars! In fact, the church labored under the mortgage for this building through the depression years until the early 1940’s when it was paid off. The auditorium was remodeled and redecorated in 1946. Even though they were small, the church was not limited in their support of the World War, or exempt from its effects. According to the Arizona Baptist Beacon #6 (August 30, 1945), “First Southern Baptist Church of Glendale (then called Calvary Baptist Church) sent copies of the state Baptist paper to all their members serving in the war. For many years, parents had cared for their preschool children in the worship services. 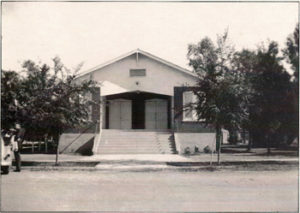 In the late 1940’s the church purchased a small wooden house just south of the auditorium. Babies through 3 year olds were cared for during the Sunday School hour, as well as during the worship service. Continued growth brought new demands for more space, so in 1948-1949, a new education building was added to the east side of the auditorium. In March of 1956, Calvary Baptist Church adopted its present name – First Southern Baptist Church of Glendale. The church then began buying lots along 58th Avenue, paving the way for the construction in 1961 of an Educational building (Building B). On June 13, 1961, all Glendale street numbers and house numbers were changed to conform to a metropolitan-wide system. The names of 2nd Avenue and C Avenue were changed at that time to 58th Avenue and Myrtle Avenue. In 1961, during the ministry of Jess Canafax, church attendance began to grow dramatically, until it was necessary to conduct two worship services each Sunday. This growth created a need for a second full-time staff member, and a critical need for additional space. Plans were being made for a new auditorium when Rev. Canafax was called to another work. Bob Warren became the new pastor and began aggressively implementing plans for the new auditorium. Bonds were sold to finance construction of the new building and enthusiasm in the congregation was evident as $270,000 in bonds sold out in 11 1/2 days. 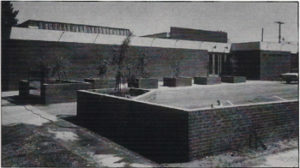 Ground-breaking for the new auditorium took place on July 1, 1968; construction started in August of 1968, and the church was able to take possesion of the new $300,000 structure on April 20, 1969. The first service in the new sanctuary took place on May 1 with 764 people in attendance and 18 additions on that day. As membership continued to grow, the church continued its impact and outreach to the community. In December of 1981, in an act of faith and foresight that would take nearly two decades to bear fruit, 14 acres of land near the NW corner of 59th Avenue and Brown Avenue were purchased for $1,000,000. Mark Mucklow became pastor of First Southern Baptist Church on October 10, 1993. The church was able to become debt free that year, and started making plans to relocate the church, debt free to the new property. The plans were to break ground in March of 2001.